The same efficient engineering and clean-cut construction, that is a hallmark of the entire Feedrail system, is evident in the internally track supported "100" trolleys. They are available either non-fusible or fusible, with or without recepticles, fully assembled ready for insertin in the track. 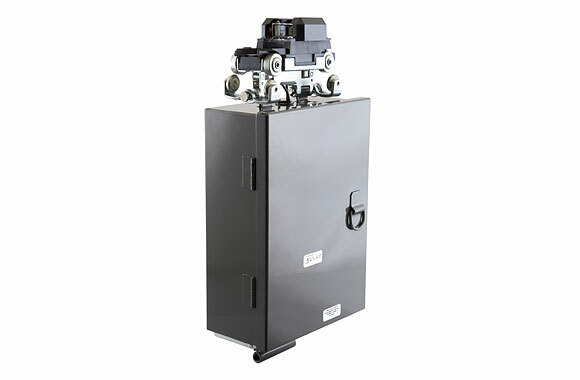 Fusible trolleys and trolleys with recepticles are factory wired. Other trolleys are furnished with crimp-style lugs. 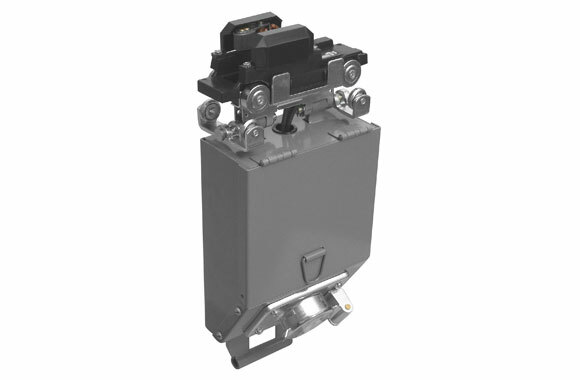 Basically, all Feedrail "100" trolleys have the chassis-insulator-contact assembly listed below. The chassis is of one-piece heavy gauge steel. It is equipped with ball-bearing wheels for supports; horizontally mounted ball-bearing guide wheels running in the slot of the track to prevent slewing, and ball-bearing wheels on pivoted arms of the undercarriage to control upthrust. This wheel combination assures smooth easy running trolleys. 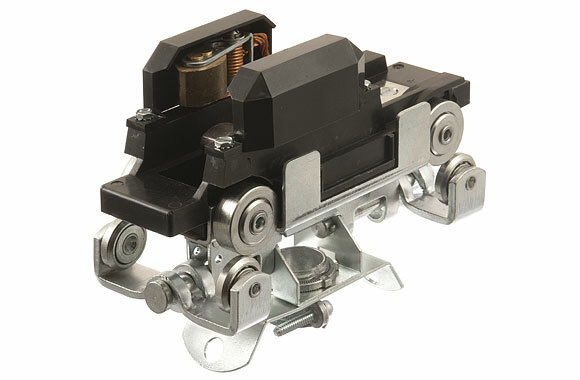 The insulator contact assembly consists of a substancially proportioned hot-molded, non-tracking, arc quenching insulator block on which arms with contact brushes (or rollers) are mounted and held in true alignment with the track bus bars. Torsion springs, one on each arm, keep the brush (or roller) in contact with the bus bar. The body is entirely closed between the contact sida and the chassis to prevent any foreign material entering between the wiring terminals and chassis. 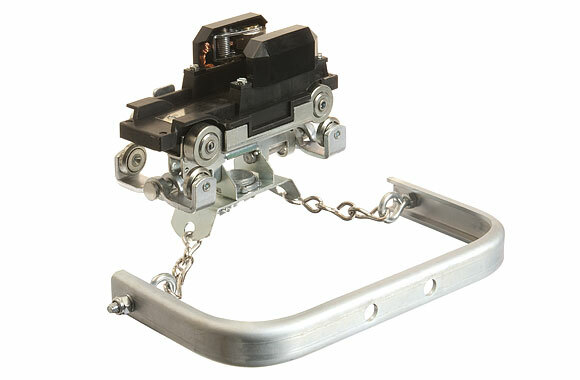 The contacts are easily replaceable from the top without requiring the removal of the body from the chassis or disturbing the existing wiring of the trolley. Feedrail "100" trolleys are furnished with two types of contacts: Copper Graphite BRUSH contacts rated 30 Amperes, and Bronze ROLLER contacts rated 20 Amperes. The special service trolleys have silver-tungsten contacts. Other trolleys can be furnished with silver-tungsten contacts on request. All Feedrail "1--" trolleys have a polarizing tab on the chasis which, operating in conjunctin with a stop within a door track, permits insertion of the trolley one way only, thereby maintaining the trolley polarity as first wired. Provision for equipment grounding is included on all trolleys. 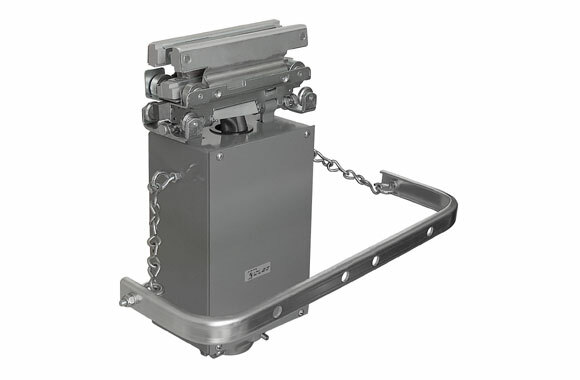 The standard Feedrail "100" non-cabinet trolleys are equipped with trolley brackets to facilitate pulling by means of tow chains. Crane and Hoist and Transfer trolleys have an additional pulling bracket and chain linkage for attachment tot he hoist or to the crane bridge. 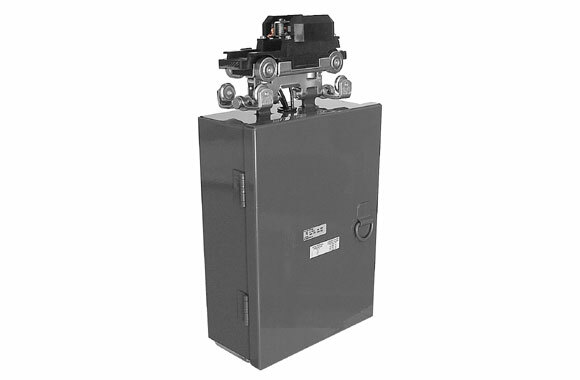 Standard Feedrail cabinets of various types are available for suspension fromt he trolley chasis. A simple suspension design makes it possible to remove and mount cabinets in a matter of minutes should a change to another type become desirable. Weights in excess of 40 pounds per trolley are not recommended. Feedrail "100" Roller Contact trolleys generally are for intermittent movement applications where speeds do not exceed 200 feet per minute. Feedrail "100" Brush contact trolleys are for more frequent moving applications such as on cranes and monorails where speeds do not exceed 350 feet per minute. These trolleys are not for use on transfer track. 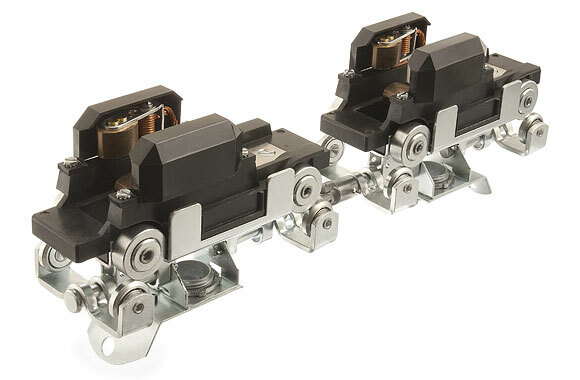 Fusible trolleys take National Electric Code Standard Cartidge fuse of the same voltage rating of the trolley (Fuses not included). Item: Single trolley - non-fusible. For: FR100 Series (Feedrail "100"). Amps: 20. Poles: 3. Voltages: 600 VAC - 250 VDC. Type of Contact: Roller. Item: Single trolley - non-fusible. For: FR100 Series (Feedrail "100"). Amps: 30. Poles: 3. Voltages: 600 VAC - 250 VAC. Type of Contact: Brush. Item: Duplex trolley - non-fusible. For: FR100 Series (Feedrail "100"). Amps: 40. Poles: 3. Voltages: 600 VAC - 250 VDC. Type of Contact: Roller. Item: Duplex trolley - non-fusible. For: FR100 Series (Feedrail "100"). Amps: 60. Poles: 3. Voltages: 600 VAC - 250 VDC. Type of Contact: Brush. Item: Trolley with hanger cabinets. For: FR100 Series (Feedrail "100"). Amps: 20. Poles: 3. Voltages: 600 VAC - 250 VDC. Type of Contact: Roller. Item: Trolley with hanger cabinets. For: FR100 Series (Feedrail "100"). Amps: 30. Poles: 3. Voltages: 600 VAC - 250 VDC. Type of Contact: Brush. Item: Trolley with beveled cabinets - fusible, with 30 ampere recepticle. For: FR100 Series (Feedrail "100"). Type: Fusible, with 30 ampere recepticle. Poles: 3. Voltages: 250 A.C. - 250 D.C.. Amps: 30. Type of Contact: Brush. Type of Fuse Block: Dead Front. Item: Trolley with box cabinet - non-fusible, without recepticle, with cable clamp. For: FR100 Series (Feedrail "100"). Poles: 3. Amps: 20. Voltages: 600 VAC - 250 VDC. Type of Contact: Roller. Item: Trolley with box cabinet - non-fusible, without recepticle, with cable clamp. For: FR100 Series (Feedrail "100"). Amps: 30. Poles: 3. Voltages: 600 VAC - 250 VDC. Type of Contact: Brush. Item: Trolley with box cabinet - fusible, without receptacle, with cable clamp. For: FR100 Series (Feedrail "100"). Amps: 20. Poles: 3. Voltages: 600 VAC - 250 VDC. Type of Contact: Roller. Type of Fuse Block: Open Front. Item: Trolley with box cabinet - fusible, without receptacle, with cable clamp. For: FR100 Series (Feedrail "100"). Amps: 30. Poles: 3. Voltages: 600 VAC - 250 VDC. Type of Contact: Brush. Type of Fuse Block: Open Front. HORSEPOWER RATINGS are for induction type and squirrel cage motors with usual speeds and normal torque characteristics. HORSEPOWER RATINGS do not apply for Wound Rotor Motors with secondary speed control no for Motors with especially low speeds or high torque characteristics. Consult technical service group for recommendations. TROLLEYS and RECEPTACLES are not intended for opening and closing circuits under load. Item: Crane and hoist trolley - single trolley - non fusible. For: FR100 Series (Feedrail "100"). Amps: 30. Poles: 3. Voltages - 220 VAC: 7-1/2HP. Voltages - 440 VAC: 15HP. Voltages - 550 VAC: 20HP. Type of contact: Brush. Note: Not for use with Transfer Track. 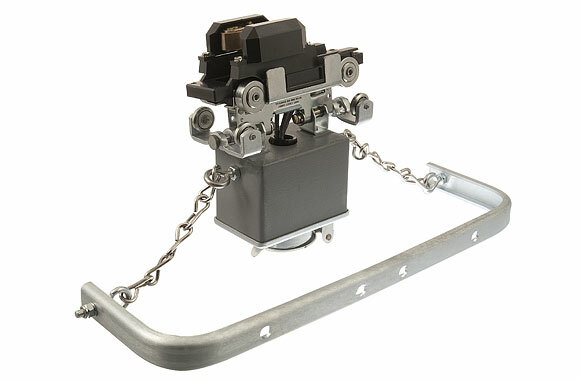 Crane and hoist trolley - single trolley - non-fusible, with receptacle. Wired complete with 30 ampere recpetacle. 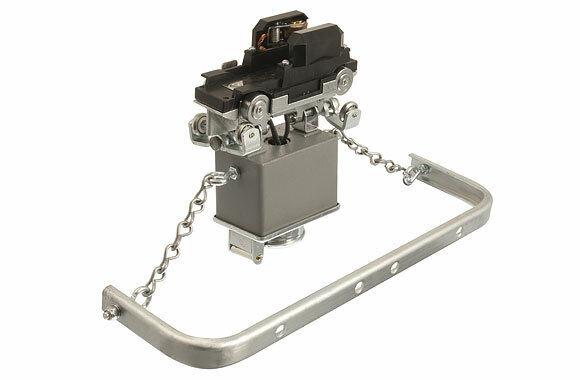 Item: Crane and hoist trolley - single trolley, non-fusible, with receptacle. For: FR100 Series (Feedrail "100"). Amps: 30. Poles: 3. Voltages - 220 VAC: 7-1/2HP. Voltages - 440 VAC: 15HP. Voltages - 550 VAC: 20HP. Type of contact: Brush. Note: Use No. 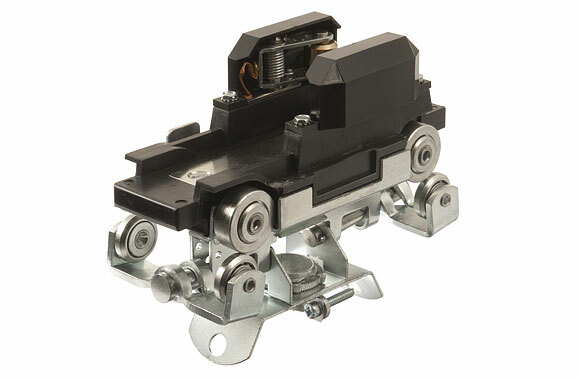 8314S Ever-Lok® Plug for use in connecting these trolleys. Note: Not for use with transfer track. 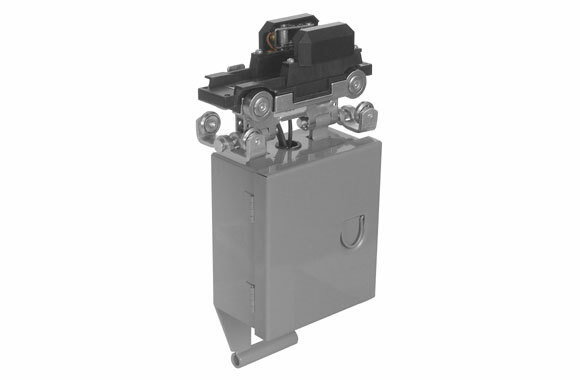 Item: Crane and hoist trolley - duplex trolley - non-fusible, without receptacle. For: FR100 Series (Feedrail "100"). Amps: 60. Poles: 3. Voltages - 220 VAC: 15HP. Voltages - 440 VAC: 30-HP. Voltages - 550 VAC: 40-HP. Type of contact: Brush. 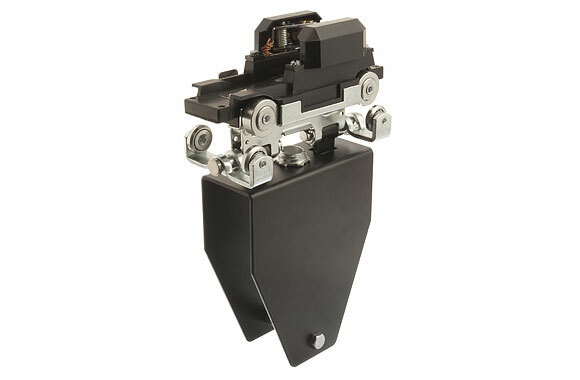 Transfer type tolleys are especially designed to facilitate crossing of gaps between crane bridges and spur runs or between slide switch sections and the main run. 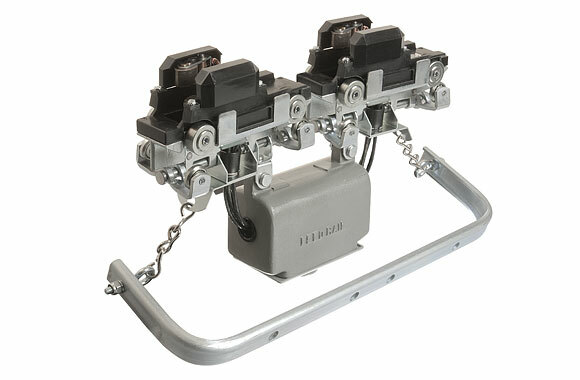 Where motor propelled hoists are used on runs which include transfer points, duplex type transfer trolleys must be used to insure continuous current while crossing the transfer points. 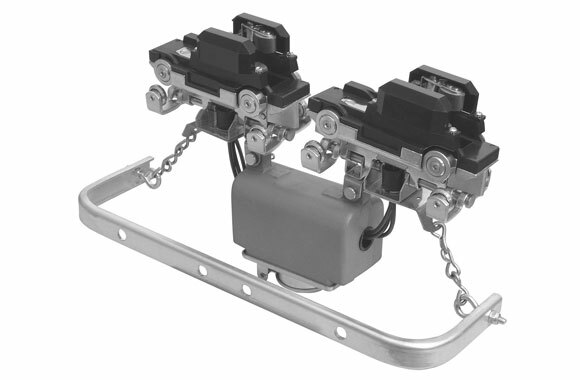 Transfer type single trolley - non fusible, for use on track runs which include transfer gaps. Item: Single transfer type trolley. For: FR100 Series (Feedrail "100"). Poles: 3. Amps: 30. Voltages - 220 VAC: 7-1/2 HP. Voltages - 440 VAC: 15 HP. Voltages - 550 VAC: 20 HP. Type of Contact: Brush. 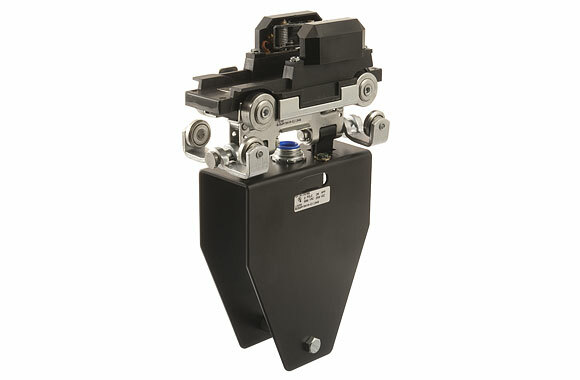 Transfer type single trolley - non -fusible, with receptacle, Wired complete with Ever-Lok® 30 Ampere receptacle. Item: Single transfer type trolley. For: FR100 Series (Feedrail "100"). Amps: 30. Poles: 3. Voltages - 220 VAC: 7-1/2 HP. Voltages - 440 VAC: 15 HP. Voltages - 550 VAC: 20 HP. Type of Contact: Brush. Note: Use No. 8314S Ever-Lok® Plug for use in connecting these trolleys. Transfer type duplex trolley - non-fusible, for use on track runs which include transfer gaps where current must be maintained while crossing transfer points. 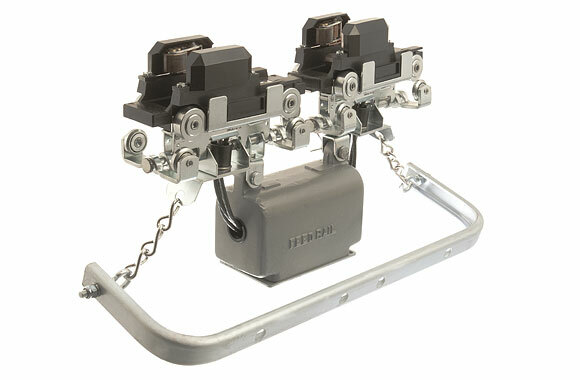 These trolleys must be used on motor propelled hoists to provide continuous current while crossing transfer points. Item: Duplex transfer type trolley. For: FR100 Series (Feedrail "100"). Amps: 30. Poles: 3. Voltages - 220 VAC: 7-1/2 HP. Voltages - 440 VAC: 15 HP. Voltages - 550 VAC: 20 HP. Type of Contact: Brush. Item: Duplex transfer type trolley. For: FR100 Series (Feedrail "100"). Amps: 30. Poles: 3. Voltages - 220 VAC: 7-1/2 HP. Voltages - 440 VAC: 15 HP. Voltages - 550 A.C.: 20 HP. Type of Contact: Brush. Note: Use No. 8314S Ever-Lok® Plug for use in connecting these trolleys. For use on straight track only without transfer gaps. Typical of Feedrail's advanced engineering design, this single unit trolley combines all the essential features of the standard trolley series with the special requirements of high power full rated take-off. It is ideal for heavy tonnage travelling cranes, hoists and similar equipment. These trolleys differ in construction details from the general trolley description in that the contact assembly consists of three substantially proportioned mechanically strong arc-resisting blocks on which silver tungsten brush contacts, one per pole, are mounted and kept in continuous contact with the bus bars by individual compression springs. Solderless type pressure connectors are within a heavy gauge sheet steel terminal box. 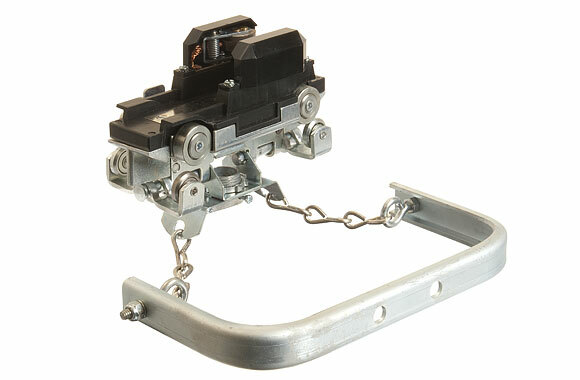 A cable clamp is provided as a pulling bracket with chain linkage to make the positive attachment to the equipment being powered. Item: 100 ampere special service trolley. For: FR100 Series (Feedrail "100"). Amps: 100 (Maximum amperage under non-inductive loads). Poles: 3. Voltages: 600 Volt A.C. - 250 Volt D.C.. Voltages - 220 VAC: 30 HP. Voltages - 440 VAC: 60 HP. Voltages - 550 VAC: 76 HP.